Today’s guest(s): Antonio Enrique, Editor of the Pilot newspaper, and Fr. Carlos Flor, parochial vicar at Immaculate Conception Parish, Revere. Summary of today’s show: Fr. 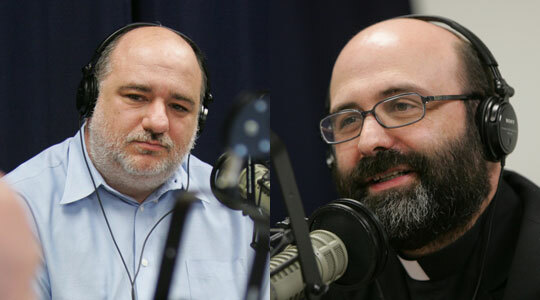 Carlos Flor and Antonio Enrique shared with Scot their experience of life in the Neocatechumenal Way, a new movement in the Church that allows people to find the love of God in the midst of their busy lives and to become part of a loving community. 1st segment: Scot said in Cardinal Seán’s pastoral letter on Pentecost on evangelization, he addressed the topic of new communities. After the Second Vatican Council, the Church has witnessed an outpouring of the Holy Spirit through the blossoming of new movements and ecclesial communities. They bring great vitality to the life of the Church. They are a sign of great hope for the Church in the new millennium. The Church in every generation is both old and new. Throughout the centuries we have seen the great blessing of so many new religious orders, reform movements and lay associations that responded to the needs of a particular era. Today, many of the new movements and communities are showing great success in communicating a deep spirituality to their members in the context of small, close-knit communities. They energize their people to be evangelizers who bring the Good News they have received to those around them. Without those forces of renewal, the Church can sometimes become too focused on maintenance and the internal aspects of pastoral work. Many of these small groups and communities are already present in the archdiocese: Cursillo, Charismatic Renewal, Communion and Liberation, Opus Dei, Focolare, Communities of Saint Egidio, The Neocatechumenal Way, ARISE, The Legion of Mary and others. Throughout the years I have known them and experienced firsthand the fruits of Christian life that sprout from their activity, including strengthening of family life, openness to life, and vocations to the priesthood and religious life. Scot welcomed Fr. Carlos Flor, who attended a Redemptoris Mater seminary and is now a priest in the archdiocese, and Antonio Enrique, who came from Spain as a missionary family of the Neocatechumenal Way and is now the editor of The Pilot. He gave a brief history of the Way. The Neocatechumenal Way began in 1964 in the slums of Palomeras Altas, Madrid, through the work of Mr Francisco (Kiko) Argüello and Ms Carmen Hernández who, at the request of the poor with whom they were living, began to proclaim to them the Gospel of Jesus Christ. As time passed, this kerygma was embodied in a catechetical synthesis, founded on the tripod: “Word of God-Liturgy-Community”, that seeks to lead people to fraternal communion and mature faith. This new catechetical experience, born in the wake of the renewal inspired by the Second Vatican Council, attracted the keen interest of Archbishop Casimiro Morcillo, then Archbishop of Madrid, who encouraged the initiators of the Way to spread it to the parishes who asked for it. This experience of evangelization thus spread gradually through the Archdiocese of Madrid and to other Spanish dioceses. In 1968, the initiators of the Neocatechumenal Way arrived in Rome and settled in the Borghetto Latino. With the permission of Cardinal Angelo Dell’Acqua, then Vicar General of His Holiness for the city and district of Rome, the first catechesis began in the parish of Our Lady of the Blessed Sacrament and the Canadian Martyrs. Since then, the Way has continued to spread to dioceses around the world and even to mission countries. Scot asked Antonio how he first encountered the Neocatechumenal Way. He encountered them in his last year of high school when he had experienced a crisis of faith. He had decided that the Church was not for him, that the Church was imposing on people to prevent them from living a happy life. Also, in Spain, it was common for people to think that the Church was the reason for political problems. But he also recalls being very lonely at the time. A priest invited him to a catechesis. The priest said, If you are happy don’t come, but if you feel a need or emptiness in your life, please come and see. Fr. Carlos said his parents found the Neocatechumenal Way when he was 9. His parents were going through a crisis in their marriage and the pastor invited them to the catechesis that was offered in the parish. The parents got involved and it helped them very much and their marriage was saved. In his teen years, he had his personal struggles and he worked hard because he wanted to be a doctor. He was living very much in the world, going to the disco, involved in sports, trying to have fun. But he found himself insecure and unhappy and rebellious. He was preparing to enter medical school but was unhappy. So he entered the Way through a catechesis, and he received a gift from God in realizing that the Church is his Mother and a community, not just someone who wants him to feel bad, when he wants to feel good. Then he was invited to attend the first World Youth Day in Rome in 1984. He discovered the beauty of being Catholic and of the Church and what the Lord was doing in other people’s lives. He played the guitar in the community and that kept him involved because he liked the attention. But little by little, the Lord began to open his eyes to his own sin and his potential. He learned that his failings didn’t come from others, like his family or others, but from within. After 7 years in the Way and another World Youth Day, this one in Czestechowa, Poland, in 1991 he felt the call to enter the seminary. Scot said Cardinal Pell at World Youth Day in 2008 estimated that about one-third of those attending were part of the Neocatechumenal Way. At World Youth Days, the Way has vocational meetings where thousands of young people come forward to respond to a vocational call. That was Fr. Carlos’ experience and almost all the young men who stood up with him in Poland are still priests today. Fr. Carlos said his vocation is not just his personal decision, but the result of 7 years walking with his community, struggling with faith and accepting the grace of God. Seeing so many people in need of an experience of the Neocatechumenal Way touched him because he wanted to serve the Church out of gratitude for saving his life and for how his parents’ marriage was saved. Scot said there are 87 Redemptoris Mater seminaries in the Church that are the fruit of the Neocatechumenal Way. Seminarians from the Way put themselves in the hands of the Way to be sent to any of the seminaries anywhere in the world. The community has vocation centers for young men who are interested in the priesthood to help the discernment process then they go to the vocational meetings where they accept to be trained in any place in the world and to say they have a desire to serve in the Church anywhere in the world. The names are chosen by lottery and Fr. Carlos was sent to Newark. The bishop of that diocese has authority over the priest and can assign the priest in his own diocese or can release him to missionary service. Fr. Carlos was released to service in Boston. He now can be re-assigned to another place anywhere in the world. 2nd segment: Scot asked Antonio about the catechesis of the Neocatechumenal Way. He said the catechesis is a time when the Church presents the faith to anyone who will listen. Nothing is expected. Anyone can go, especially those who are far away from the Church. It is a place in the parish where people who are estranged from the Church can come back. It is a period in which the Word of God is presented to the people and people are encouraged to relate to the love of God and are told that whatever has happened in their lives, God has a plan for them, a beautiful plan. God wants to work for them in their lives. At the center is the kerygma, the announcement of the Good News. That Good News is that Christ came to save us. Antonio said because of temptation we are constantly being pulled away from God, but the catechesis says God wants to bring us back to him. God never forces anyone to love him. If we accept his love we become free, but if we reject God we become slaves to sin. This announcement of the Good News makes people realize that there may be a different way of living. The fact of difficulties in life suddenly is on a different level because if you put the kingdom of God first, everything else will be given you, as Jesus says in the Sermon on the Mount. Not that problems will go away, but that you will be happy in all situations of life. Antonio said he always grew up trying to be good so that God would love him. But he realized that he couldn’t be good, that he kept sinning. But in the catechesis he heard that God loves you the way you are, not that he wants you to stay the way you are. The Neocatechumenal Way is a space where the grace of God can be heard in the midst of so much noise which makes it difficult to hear God. The catechesis makes a space of silence to hear God. They bring the good news that God loves you the way you. Scot asked Fr. Carlos why they call it the Neocatechumenal Way, as a post-baptismal or adult catechesis. Fr. Carlos said it is an itinerary of Christian formation so that people who are called to belong to a community in this way will enter into a process that will be a number of years in the form of a catechumenate of the Church. It is a way to rediscover the riches of our baptism. In the early Church when adults would approach the Christian community and ask to be received into the Church, the Church would invite these people to enter t he catechumenate, a special time for them to discover the love of God, to know themselves, and to have conversion. If at the end of this time, there were signs of real conversion, then that person was brought to baptism. Today, when many people are already baptized, but they are living as if they are pagan, the catechumenate is a new catechumenate. They follow the same steps as the RCIA (Rite of Christian Initiation of Adults) as they do in parishes, but the difference while RCIA is done over a small period of time (in order to bring them to baptism rapidly), the neo-catechumenate is done over a much longer time. Scot noted that many people notice that many new converts through RCIA know the faith better than those who have been Catholic all their life. It is a gift to have this path of adult catechumenate. Antonio said Pope Paul VI is the one who named the Neocatechumanal Way. There were questions at the time whether there could be a catechumenate for those who are already baptized. Paul VI said it’s not important when the catechemunate occurs, before or after baptism. It just needs to be done. Antonio said 50 years the culture of society would help you maintain the faith, but today those walls of society have come down. We are surrounded by a society that tells us to reject the elements of the Christian culture that we used to have around us. So we need to rebuild the Catholic culture to help us to live the realities of the Church. It’s very difficult to do this in very big groups in the Church. If you can create an environment where people can get to know each other very well in all their strengths and weaknesses, then you are supported and growth can happen. The Neocatechumenal Way creates a space where people can grow in the faith, can be welcomed, where no questions are asked, where people must be good before they can enter. If you allow God’s grace to happen, then it will change you. Scot noted a Gallup poll said that one of the best indicators of whether someone remains strongly rooted in their church is whether they have close friends there. 3rd segment: Scot quoted Pope Benedict’s comments on the Neocatechumenal Way earlier this year. “For more than forty years the Neo-Catechumenal Way has been contributing to the revitalisation and consolidation of Christian initiation in dioceses and parishes, favouring a gradual but radical rediscovery of the riches of Baptism, helping people to savour divine life, the heavenly life which the Lord inaugurated with His incarnation, when He came among us and was born like one of us”. “Over the last few years the process of drawing up the Statues of the Neo-Catechumenal Way has reached a fruitful conclusion and, following an appropriate experimental period, they received definitive approval in June 2008. Another important step was made in recent days with the approval, by the competent dicasteries of the Holy See, of the ‘Catechetical Directory of the Neo-Catechumenal Way’. “With these seals of ecclesial approval”, the Pope added, “the Lord today confirms this precious tool which is the Way and again entrusts it to you so that, in filial obedience to the Holy See and the pastors of the Church, you may contribute with renewed energy and ardour to the radical and joyful rediscovery of the gift of Baptism, and offer your own original contribution to the cause of new evangelisation. The Church has recognised in the Neo-Catechumenal Way a particular gift created by the Holy Spirit. As such it naturally tends to insert itself into the harmony of the ecclesial Body. In this light I exhort you always to seek profound communion with pastors, and with all members of the particular Churches, and of the very different ecclesial contexts in which you are called to work. Fraternal communion between the disciples of Jesus is, in fact, the first and greatest witness to the name of Jesus Christ”. Scot asked Fr. Carlos how these small groups form in parishes. Fr. Carlos said a pastor sees the need of the lost sheep, especially those who are far from the Church, and so he forms a catechesis, which starts with a team from the Neocatechumenal Way from another parish. There are 15 talks that include a strong call to conversion and a proclamation of the kerygma. They include the message that God loves you, that Christ wants to give you his Spirit to know that your life is not a mistake and that God has a plan for you. The catechesis slowly leads people to the conviction that they want the Spirit of Christ in them to create hope in them and bring them to eternal life. Gradually the desire to the deepen the faith grows and then they invite them on a weekend retreat, which teaches them the fundamental importance of the Eucharist and show them the Way, which is the Sermon on the Mount. The people are invited to participate in a community of the Neocatechumenal Way, which forms in the parish, led by the pastor and in communion with the catechists entrusted the pastoral care of the community. The community works on a tripod: celebration of the Word of God celebrated on Wednesday, the Eucharist celebrated by the community on Saturday, and then a monthly meeting to share experience and life together. In the community, people learn to read Scripture and to read it in light of their life, they learn the importance of the roles of community, and the Eucharist becomes the heart of the community. Fr. Carlos said for him what helped him the most was the brothers and sisters of the community, who helped realize he was not alone on the journey. In the beginning, there re many walls between people, but over the years the barriers between people come down and they share more and more of their lives. Scot said the Way is in 87 countries, there are 750 communities in the US, and in the Archdiocese there are 15-20. Scot asked Antonio how he and his family came to the US. They were members of the Neocatechumenal Way in Spain and families can enter the missions where they are sent out to dioceses where they are welcomed and take part in the creation of new communities. Antonio said this was the idea of Pope John Paul II in his call for a new evangelization of Europe. Originally they were sent to northern Europe where it was Christian but not very Catholic. The first families were sent to northern Norway. Antonio said the Neocatechumenal Way would not be here today without the work and advocacy of Blessed John Paul II. He said he met his wife in the community, they got married, and started having children. They learned in the community that if you let God lead your life, you will experience God’s eternal life and the love of God. At a certain point they heard a call to present themselves for the mission and let others discern whether they were truly being called. They offered for four consecutive years and nothing happened so they bought a house. At that point they entered in the lottery and they were sent to Boston. Cardinal Law had requested two families for the Archdiocese. They had 7 children at the time and have had 4 more since then. Scot said Cardinal Law didn’t call him to be the editor of the Pilot. Just wanted them to be a presence of living the faith in East Boston. There was no job waiting for him here and he wasn’t an employee of the Archdiocese. He left his job as a manager at General Electric in Spain and came here. When they first arrived, they lived in a closed convent. He didn’t have a job for several months and eventually got work for the state. From there, after several other stops, he eventually became editor of the Pilot. Fr. Carlos said people who want to know more can contact him at Immaculate Conception Church in Revere and he will help people find a community. A pastor who is interested in founding a community in his parish can also talk to Fr. Carlos. Antonio said any parish with a community can see the amazing fruits of these communities in the parish.